An impressive lineup of mixed martial arts middleweight contenders gathers for the 2005 Critical Countdown event held at Japan's Saitama Super Arena. The fight card includes matchups between Wanderlei Silva and Kazuhiro Nakamura; Ricardo Arona and Kazushi Sakuraba; Alistair Overeem and Igor Vovchanchyn; and Mauricio Shogun and Rogerio Nogueira. 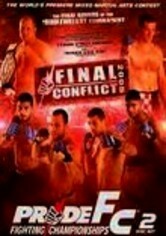 Bonus battles include a bout between Antonio Rodrigo Nogueira and Pawel Natsura.